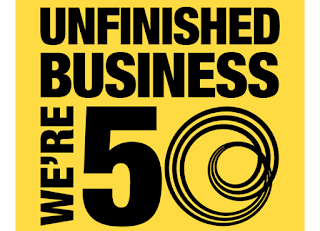 It is difficult to believe, but the London Sinfonietta is going to be 50! On 24 January 2018, the anniversary to the day, the orchestra celebrates with a 50th Anniversary Concert which is part of a season which deliberately looks both backwards and forwards, celebrating past achievements and also looking to the composers of the future. On Wednesday (28/6/2017) at the Southbank Centre the orchestra had an event to tell us about its plans, and to do a bit of reminiscing. But first there was music, members of the London Sinfonietta played Sir Harrison Birtwistle's The Message for trumpet, side-drum an clarinet, a Sinfonietta Short written for the 40th anniversary in 2008, a piece inspired by a quote Birtwistle found engraved on a Bob Law sculpture: "the purpose of life is to pass the message on". Andrew Burke, the ensemble's CEO, talked about the challenge of knowing how to mark 50 years and how they decided to both celebrate tradition and to look forward. The season's title Unfinished Business refers in part to the ensemble's wish to champion repertoire made in the post-war period which still needs more performances, but also to continue commissioning works from early and mid-career composers. The 2017/18 season kicks of with an evening at Kings Place when co-founders David Atherton and Nicholas Snowman and John Constable look back at the ensemble's early days, and there is chamber music from the early days with music by Schoenberg, Webern, Messiaen, Ravel, Birtwistle, Varese and Stravinsky. The season features some of the earliest pieces by composers who helped establish the ensemble's reputation, including its first important commission Henze's Voices (conducted by David Atherton), and there is an evening devoted to the music of another important voice from the 1970s and 1980s, Luciano Berio. Another concert features works by Xenakis, Rihm, Colin Matthews and Bitwistle which helped establish the ensemble's signature virtuoso one-to-a-part style of performance. For a Stockhausen programme, the ensemble is joined by the Royal Academy of Music Manson Ensemble whose members will be playing side-by-side with members of the Sinfonietta, conducted by Oliver Knussen. Education in all its forms has always been important; the London Sinfonietta was the first London orchestra to have a full time education officer, Gillian Moore. At the 50th Anniversary Concert the orchestra is joined by alumni from the London Sinfonietta Academy for a programme which moves from Birtwistle, Stravinsky and Ligeti, to the London premiere of a new piece by Hans Abrahamsen and a new work from Samantha Fernando, with a distinguished trio of conductors, David Atherton, George Benjamin, Vladimir Jurowski, and Tamara Stefanovich as solo piano. There is a second collaboration with experimental music series, Kammer Klang, where electro-acoustic works from the London Sinfonietta's archive are brought to new life in a fresh context alongside experimental new works. Education in its wider aspect is celebrated with LS Open, with events including players from CoMA London, Primary School groups and a 50th Anniversary Schools Concert which includes an ensemble of teenage players from Harringey and Enfield performing alongside Sinfonietta members. There is also the opportunity for members of the public to submit post-cards with musical compositions on the back, and an app which encourages you to see how accurate you can be in Steve Reich's Clapping. Looking forward to the future, the orchestra will be giving the premiere of Philip Venable's The Gender Agenda which challenges and explores traditional gender roles and a striking game-show format! Another concert features new work from three female composers, Charlotte Bray, Rebecca Saunders and Unsuk Chin. Another collaboration is with Tom Jenkinson (aka Squarepusher) who joins the ensemble to perform his own work alongside improvisations. A major new work comes towards the end of the season, Tansy Davies and Nick Drake's The Cave a striking new work which explores a future destroyed by climate change. Davies is a composer who had strong links with the orchestra in the early part of her career, in fact she told us that she first heard them when she was 14 (they came to her school) and when she was studying she went to a Sinfonietta outreach event in a prison, and she wrote her early piece Iris to a London Sinfonietta commission. The Cave will be premiered at The Printworks, a huge warehouse space in Canada Water. Full details from the London Sinfonietta's website.